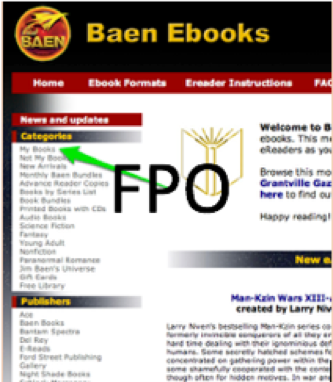 Baen is the best in Science Fiction and Fantasy publishing. We publish hardcover and paperback books, offer eARCs of new titles before they’re published, and sell DRM-free Ebooks in seven downloadable formats. We sell over 1,000 science fiction and fantasy Ebooks and feature over 250 authors published by 11 different publishing companies. We add at least four new Ebooks every month! Avoid non-standard fonts, and unnecessary changes in font face, size, etc. Publisher likes CG Omega and Lucida Bright. Typesetter likes any standard bookface, Time Roman or Courier. Make it readable, or we won't read it. If something needs special formatting—e.g., small caps for a certain entity's dialog—explain it in a cover letter. Click the "Your Account" link below your name at the top of the screen. This will take you to your account page. Click the blue "View Your Order/Billing History" link or scroll down to see your order history. You can download your books individually or grouped by orders. Click the "My Books" link on the left side of the page under the Categories section. Click the cover image, the title, or the "Download" link for purchased Ebook you'd like to download. This will take you to the product page where you will find a list of download links.